Dougall Baillie Associates were appointed by AWG developments to carry out civil and structural design duties for a bespoke laundry facility for Lanarkshire Primary Care NHS Trust. 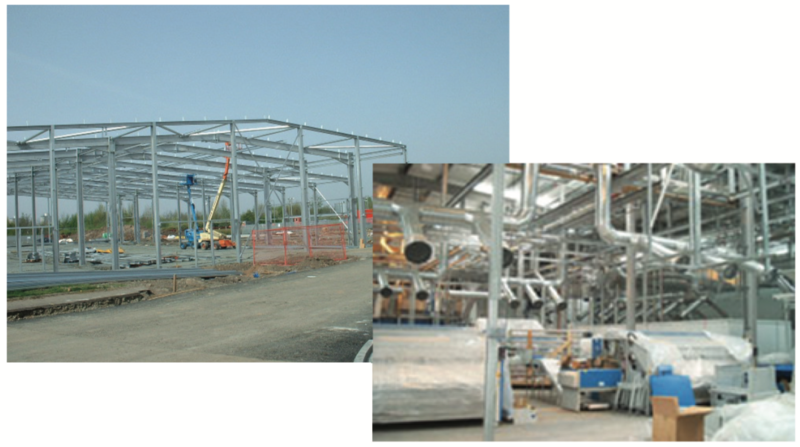 Acting as part of a Design and Build Team DBA were involved from project inception to completion and as part of our role detailed designs for services supports and significant services infrastructure including boilers and a gantry rail system. The structural solution comprised a steelwork portal frame with intermediate columns to split the approximate 45m span to 26m and 19m respectively thereby minimizing steelwork weight and foundation loadings. The building envelope was completed used steel profile sheeting and the external areas completed using a high strength concrete slab. Ground conditions on a previous industrial site were challenging with significant made ground present over the entire site and the presence of World War 2 unexploded ordnance. The 35,860 sq highly serviced building, was successfully completed within a 9 months schedule, with Dougall Baillie having involvement in the commissioning process also.